Melissa Made: TI and MIC Egyptian Hop! TI and MIC Egyptian Hop! YAY! 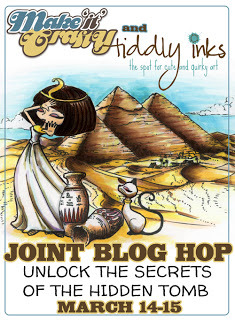 Today is the day, Tiddly Inks and Make it Crafty are teaming up with a fun and new release! We are getting a little Egyptian today and I can't wait to share my projects with all of you. Before I share though, you should really start in order for this hop. You can do so by going right HERE. You'll want to go in order and also maybe just open a new window to each blog by opening a new window for each link (click CNTRL and the link you wish to visit), which will open the next blog and keep the main post up too...that simple. This way, you can easily navigate between each blog in the hop and return to the main page when you are ready to go to the next blog. Ready to see my projects!? The first used two of the new images, one from Tiddly Inks and one from Make it Crafty. Click on the links for each store to find the images! 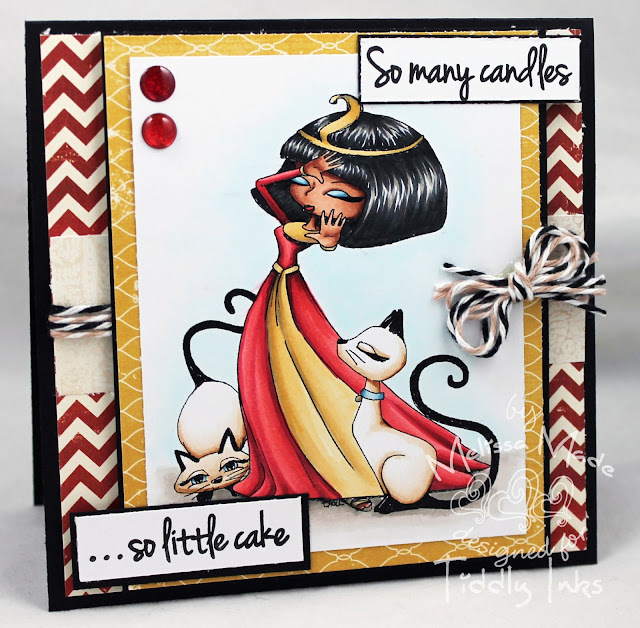 I created another one using a super DRAMA Queen from Tiddly Inks with a fun sentiment from My Craft Spot! I have no glyphs to share with you today, but make sure to get all the juicy details on the STARTING blog and collect them in order for some HOT prizes! squeeeeee!!! oh they are both divine hunny!!! Your cards are awesome! TFS God bless!! What a lovely cards you have made. I like your style of colouring. You did an awesome job on your cards!! I love the first one with the steps; she looks like she's actually walking down the steps! Lovely cards Melissa. Thank you for sharing on the blog hop. Wonderful cards Melissa, as always your coloring is fabulous!!! So beautiful! I love the soft blue in the first card - gorg. :D I love your gorgeous, elegant style - it is perfect for the images. Love both of these cards! The drama diva is just to funny...love it! Thanks for sharing. These are gorgeous!!! Your coloring is always amazing! Fabulous cards, Melissa! Awesome coloring! Just love your style Melissa... Great coloring and clean design. So much I could learn from you. Fabulous projects, Melissa. The images and your colouring are adorable. Oh wow, these are gorgeous! I love the cutie on the steps, such a lovely scene! Melissa, both of your cards are spectacular! Such great coloring and absolutely beautiful cards! Cute cards! Love the sentiments too! Such beautiful work, as usual! The images come to life! Wow, your coloring is terrific and LOVE those Siamese cats. Awesome job!